Blogger trying to tell me something? Yesterday my header disappeared! I see it in the correct place in the html code, but it is not showing up. Now, maybe by the time you read this it will be back and it was a problem between photobucket and blogger, but I do not think so as other things linked at photobucket appear to be here. Well, anyway...TIME FOR FIVE ON FRIDAY! One of the great vocal groups of the 60's-70's...It began as just CSN and all came from successful groups; The Hollies(Graham Nash), The Byrds (David Crosby and Buffalo Springfield (Stephen Stills). 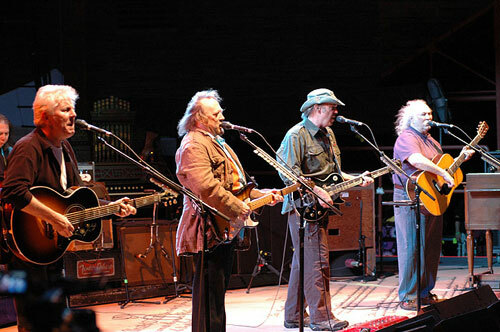 Neil Young joined in mid 1969 to round out the groups sound. With Dallas taylor on drums and Greg Reeves on bass guitar. They band had one show, in Chicago opening for Joni Mitchell, before they were thrown into the biggest musical event ever... Woodstock! I'm not much of a Neil Young fan, but I do like the edge he brought to the group's sound. I like him as part of CSN&Y, but not solo. As for CSN...they are one of my all time favorites. The songwriting is so layered and full. Your Header: Not viewable by me. A great set.I do love CSN&Y the header is there when I opened your site.Blogger was giving me a lot of grief as well this well. it would not let me make comments on different blogger sites.Vinnie(Bond),I hope that you have a great weekend. The header is viewable now. I like CSN&Y, have always liked Young more by himself. Still they make some great music together.